Organizing Against The War On Women was started when two friends, Karen Teegarden and Desiree Jordan, were speaking on the phone very late on February 18, 2012, outraged that no one was taking to the streets with all the anti-women legislation and rhetoric taking place across the country. As they were hanging up, Desi said “we should build it…they will come”. How many of us say things like that only to go on with our daily lives? 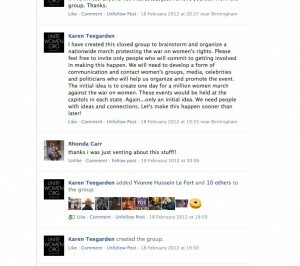 Upon hanging up, Karen created the Facebook group “Organizing Against The War On Women” and the following morning had over 500 people asking to join. Karen called upon two friends in Michigan, Lora Trezil and Rhonda Carr to help set up all of the state groups with her. 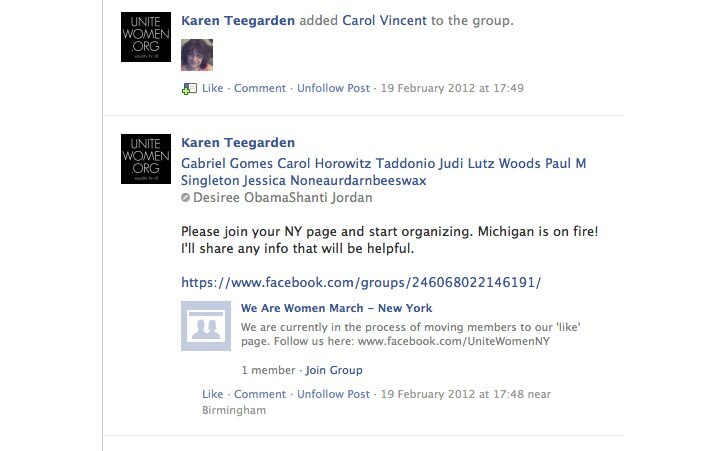 After Karen created the New York Facebook Group, We Are Women March – NY, Desi pulled an amazing team together to plan the New York event while Anita Doll Fiouris, Lora and Karen focused on the rest of the country, setting up a communication structure that would work with state, regional and national groups. Very quickly we had a team working with all the States and building our social media platforms. 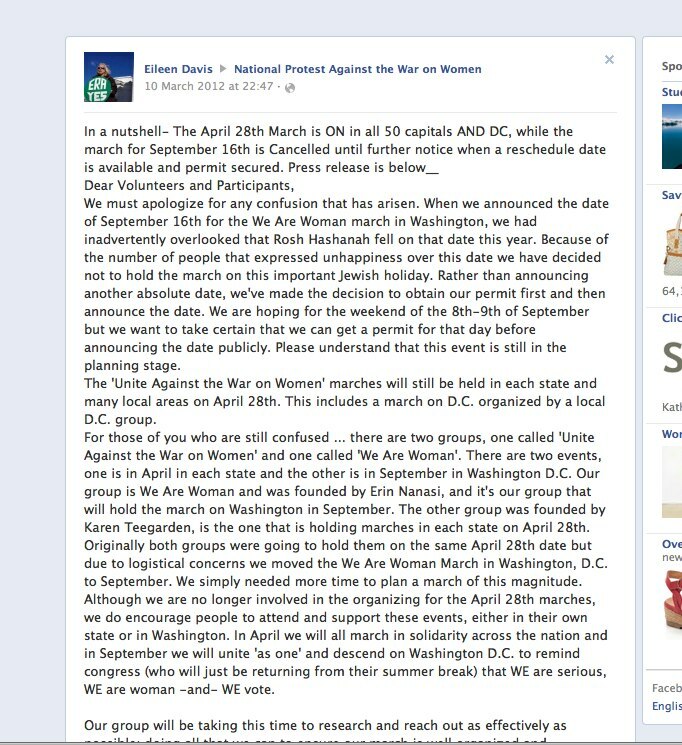 Very early on, the April 28th events were named “Unite Against The War on Women” from “We Are Women March – (State)” better reflecting the rallies most of the States were planning. 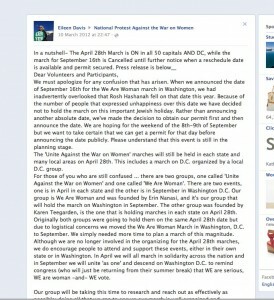 Within days, Karen received a message from Erin Nanasi who was planning a national rally in Washington DC. 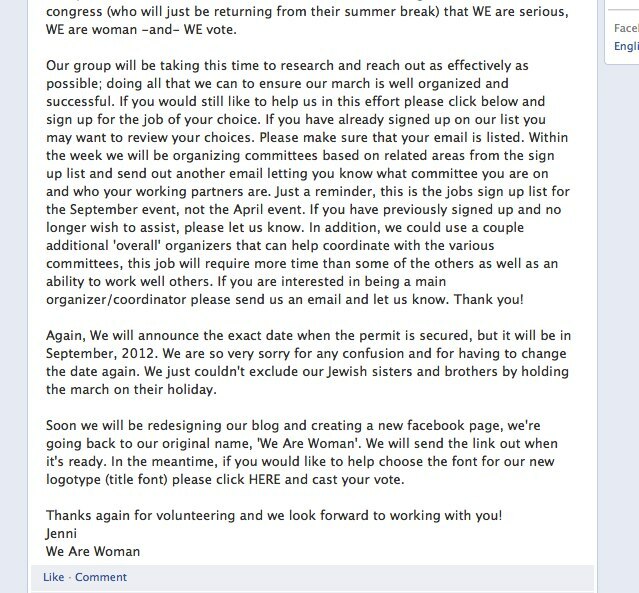 They decided to join forces, with Erin’s group planning the DC event and Karen’s group planning the rest of the country. Two weeks later, Erin messaged that she needed to back out due to illness. She had no one physically in DC to take over the effort so we quickly began planning a DC Beltway event. 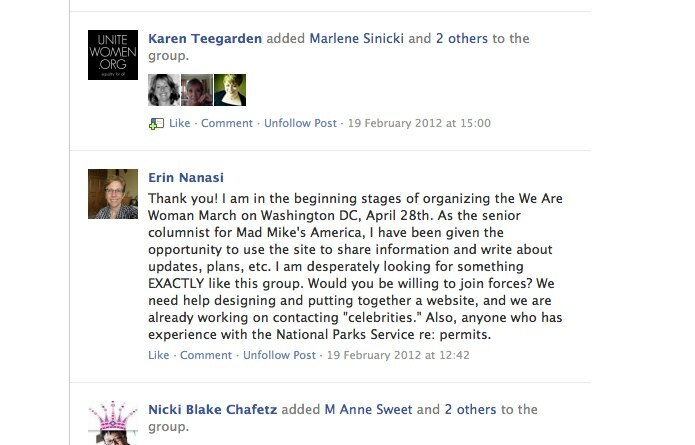 It was decided later that Erin and her group would plan their original national event but move the date from 4/28 to September 16th. 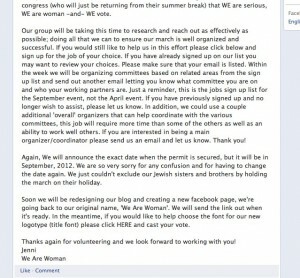 Ultimately, the We Are Woman Rally was held in August, 2012. This amazing team across the country pulled together 55 rallies in 45 states on 4/28/2012. Many thought, and still do, that we were crazy to attempt something of this magnitude with no funding or media support. But the rallies served a very important purpose…the ten weeks of planning brought tens of thousands of people together with one common goal…we needed to wake people up to what was happening to their rights! If we hadn’t achieved that goal, our continuing work would not have had as much impact as it did. Our social media reach continued to grow and still does today. 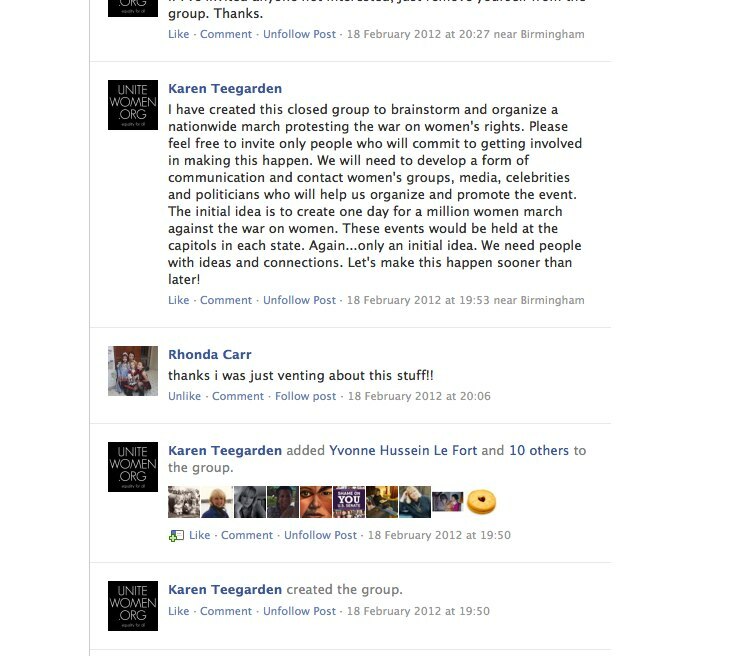 Very quickly, Karen realized that the initial goal of planning rallies across the country would only be the beginning of the work they could do to educate the public on issues affecting women and begin to change the cultural and social conversation disrespecting women overall. In that first week, she focused on the overall vision of what this movement could become and the potential impact it might have on society. This movement would not have happened if it weren’t for that conversation between Karen and Desiree that night in February. But Karen needed to take it to another level nationally and eventually globally. Hence, UniteWomen.org was born.